Appropriate for High School and College History Classes; University Urban Studies, Urban Design, Art History, and Civil Rights Classes. Teacher Guide can be adapted to Primary and Secondary School geography, history and art curriculum. 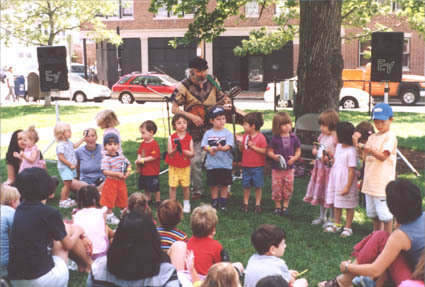 A sidewalk minstrel from Boston with over three decades of performances, Stephen Baird, enchants young and old alike with wonderful stories, poems, jokes, and plenty of songs. His repertoire is seemingly endless, ranging from Irish ditties to ragtime to sing-a longs. With leprechaun charm, he accompanies himself on all manner of instruments; mandolin, banjo, dulcimer, autoharp, kazoo, tambourine, and the fascinating limber jack - a percussion instrument in the form of a wooden puppet toy. His legendary "bag full of surprises" includes elephant, bumble bee and tooth paste costumes to dress up the audience plus life size puppets. Stephen Baird makes a place where people meet and touch each other through art and music. 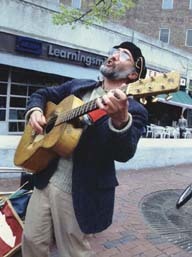 Stephen Baird, street singer, has toured forty-eight states and Europe, playing on street corners, at fairs, festivals, concerts, coffeehouses and over one hundred college campuses since 1971. 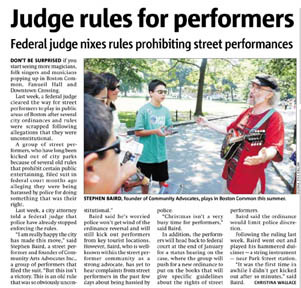 Instrumental in legalizing street performing in Boston in 1973, he has since become nationally renowned as an advocate of street performing. He has been featured in Time, Newsweek, People, Nationa Law Journal, American Bar Association Journal and many other magazines, a PBS-TV documentary, and at the Kennedy Center for the Performing Arts in Washington, D.C.
Stephen Baird restructured Club Passim, the historic folk music venue in Cambridge, as a nonprofit organization in 1995-1997, co-founded the Bread & Roses Festival in Lawrence in 1986, founded the Folk Arts Network in 1982, published the New England Folk Almanac and New England Folk Directory from 1982-1996, produced Jamaica Plain Open Studios and was the Executive Director of the Jamaica Plain Arts Council from 1999-2001. He is currently the Executive Director of Community Arts Advocates. From Ben Franklin to Tracy Chapman, Louis Armstrong to the Violent Femmes, the streets of this country have been the avenues of self expression for emerging artists and musicians. Entire art forms such as tap dancing to break dancing, jazz to blues, rock n' roll to rap singing have risen from the fusion of diverse artists who have performed on the streets of New York City, Boston, Chicago and New Orleans. The history of popular culture has direct roots in the history of street performances. Today the streets are still a dynamic stew of sounds and rhythms from around the world. Contemporary jazz guitarist Stanley Jordan who developed the "touch-technique-playing-style" performed on the streets of Milwaukee and Madison, Wisconsin before moving on to the streets of Boston and New York and greater recognition. 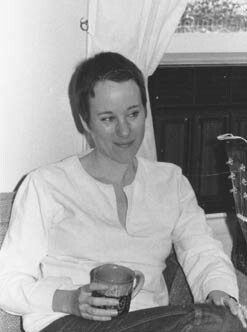 Both Martin Sexton and Tracy Chapman performed on the street corners of Cambridge's Harvard Square, much like Joan Baez did three decades earlier. Paul Simon and James Taylor plied the street of London with their songs to earn cash for demo tapes. The opportunities are boundless. With a little fearless ambition and reckless faith in the moment of surprise the next street corner can become a Carnigie Hall where the most profound artistic experience can change the inner and outer landscapes. Locate Boston (MA), Chicago (IL), Alexandria (VA), New Orleans (LA), New York City (NY) on a United States map. Discuss the three branches of government: Legislative, Judiciary, Administrative and theory of checks and balances. Students may prepare a bulletin board display. Do you recognize any of the songs or games used in the program? Which ones? Why do you think music was such an important part of the lives of people? What do we learn about people from their songs? Students can find performance locations on U.S. and World maps. Passing the Hat - Street Performers in America (Delacorte Press 1981) by Patricia J. Campbell Passing the Hat is still the most comprehensive book on street performing in the United States. There are chapters on the history, legal issues and performance techniques as well as profiles and pictures of an array of artists-- jugglers, musicians, magicians, comedians and clowns in Boston, New York, New Orleans and San Francisco. Underground Harmonies - Music & Politics in the Subways of New York (Cornell University Press 1995) by Susie J. Tanenbaum The title describes the book well. It covers the ethical issues and conflicts between auditioned and scheduled artists by the MTA and the First Amendment rights of independent artists. Drawing a Circle in the Square-Street Performing in New York's Washington Square Park (University Press of Mississippi 1990), by Sally Harrison-Pepper A scholarly book based on a four-year study of street performances in Washington Square Park in New York City. Rediscovering the Center City (Doubleday 1988) by William H. Whyte The author, William H. Whyte, was an expert architect witness in favor of street performances in the Davenport v. Alexandria, Virginia and the Friedrich v. Chicago, Illinois federal court cases. He provided important testimony to rebut the exaggerated and bogus public safety issues often presented by city officials to suppress and ban street performances. Details of this issue can be found in the third chapter. William H. Whyte also wrote an earlier book titled The Social Life of Small Urban Spaces which documented street performances and pedestrian behavior (See: Project for Public Spaces, 153 Waverly Place, 4th floor, New York, NY 10014 Fred Kent, President, Phone: 212 620-5660, Fax: 212 620-3821 Email: pps@pps.org. Web site: http://www.pps.org/). Chambers, Edmund K., The Mediaeval Stage, Oxford University Press, London, UK, 1903 A scholarly and erudite book with many references and foot notes in Latin, Greek, Arabic, Hebrew, French, old English and old German dialects. Documents the history of the stage with references to street artists known as mimes, jongleurs, gleeman and minstrels. Includes details on the minstrel guilds of the 10th to 14th centuries. Mayhew, Henry, London Labour and the London Poor, 1864 The resource material for the previous book and the first major book on sociology in the the Victorian era. Colardelle, Michel, Musciens des Rues de Paris, Musée National des Arts et Traditions Populaires, 1997-1998 This is a scholarly book in French, by museum ethnologists that shows maps of Paris in 1694, 1847, 1872 and 1972 then traces street music history through paintings, prints and photographs (includes a recording). Wonderful prints of one man band in 1810 with pan pipes, lute, and drum on his back played with rope and pulley from his foot. Plus there is a photo of a one man band in 1877 followed by photos of the parents and children of this same family playing one band in 1977! A.K.A. DOC: The Oral History of a New Orleans Street Musician--James May (a.k.a. "Doc Saxtrum:"), by Geoffrey Edwards and Ryan Edwards, Cadence Jazz Books, The Cadence building, Redwood, NY 13679 www.cadencebuilding.com See review: http://www.jazzreview.com/articleprint.cfm?ID=557 Oral history interview of New Orleans street sax player James May. Describes battles with police and turf wars with other street artists and performers. Streets for People (Van Nostrand Reinhold 1982) by Bernard Rudofsky A passionate exultation to make America's street pedestrian friendly. City planners and architects often make an urban environment hostile to street performers and pedestrians. This book explores the great public spaces and architecture in cities around the world. Boyle, Wickham, On the Streets: A Guide to New York City's Buskers, NY, New York City Department of Cultural Affairs, 1978 A delightful guide that was funded by the National Endowment for the Arts and New York State and City Arts Councils. The historical notes by Richard Bruno is a great review of street artists from 400 B.C. to 1978 parts of which are quoted in Passing the Hat. Includes a humorous tale of a street magician who fought off two muggers with a handkerchief that was transformed into a magic wand. Sheridan, Jeff, and Claflin, Edward, Street Magic, Doubleday, NY, NY, 1977 This book by New York City street magician Jeff Sheridan has tips, anecdotes and historical references of street magicians in India and China. 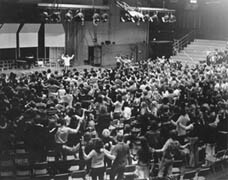 Lesnick, Henry, Guerrilla Theater, Avon, 1973 Book on the street theater movements of the 1960s. Towsen, John H., Clowns, Hawthorne, 1976 Book on the history of clowning. Finnigan, Dave, The Complete Juggler, Vintage Books, Random House, NY 1987 How To Guide on juggling scarves to juggling multiple clubs to juggling people. See page 509 for tips on how to develop a street performance routine. Si te quieres por el pico divertir--. historia del pregón musical latinoamericano by Cristóbal Díaz Ayala. Cubanacán. San Juan, Puerto Rico. 1988 Book on Latin-American street music and street musicians. Teatro y animación de base en Chile, by Carlos Ochsenius, CENECA. Santiago-Chile. 1987 Book on amature and street theater in Chile. "Are Silly Laws Taking the Fun Out of Your City," John Woytash, American Bar Association Journal, March 1977, p. 298. "Stars of the Summer Streets," People Magazine, July 22, 1985 This was an eight page photo-journal review and story of street performers in Boston, Washington DC, Philadelphia, Chicago, San Francisco and Los Angles. "On the Corner" by Margit Detweiler. Philadelphia City Paper, April 18&endash;25, 1996 earshot http://www.citypaper.net/articles/041896/article012.shtml Article on Philadelphia street music scene. "Busker Told To Pay His Way" by Clare Cruise and Sarah Rothwell http://www.oxfordstudent.com/2000-11-02/news/14 Article on street busker who plays the flute and sells his own music recordings without a permit in Oxford, England. BUSKING WITH THE STARS Posted by mrG, February 28, 2003 09:29 AM http://www.teledyn.com/mt/archives/000615.html Article on lack of ethics of BCC anchor Damon Gough who tried busking for a day. 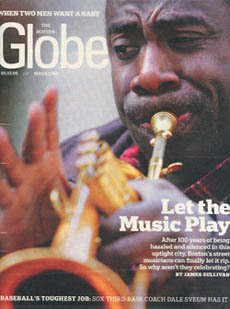 The Sweet Sound of Street Music, Eugenia E. Gratto, July 24, 2001 http://www.suite101.com/article.cfm/6146/74885 Article on Washington DC street music scene. http://www.streetmusicny.com "Street Music" documentary film which focuses on NY street and subway artists by JD Marlow. Completed in July 2003. Site and dvd film includes historical and legal references, interviews with Susie J. Tanenbaum (Underground Harmonies), Robert Turley (Street bass player who filed Federal law suit against NYC) a host of other street perfomers, Music under New York administrators, Fred Kent from Project for Public Spaces, historical film clips by Willim H. Whyte, film clip of arrests. Comprehensive documentary explores performances in public spaces. Below are some sample links to articles featuring Stepehn Baird's arts advocacy work. See the entire web site for additiona references. 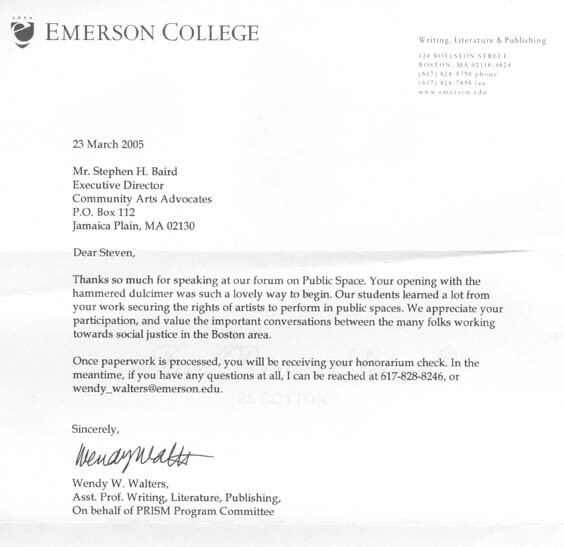 WB 56 News, Fox 25 News, and New England Cable News all covered the story on December 24, 2004.